f you read Architectural Digest and watch HGTV, always looking wistfully at lavish patios built for total comfort and year-round use, you probably imagine that any respectable patio must require an architect, interior designer and upscale decorator. If, however, you are not an heiress or a renegade Kardashian, you need not abandon all hope of enjoying an attractive, inviting patio. With some imagination and expert shopping, you can create a beautiful family-friendly outdoor space even without a trust fund and personal assistants. Of course, you can spend thousands on lattice work, custom patio roofing or an upscale patio cover. Experts say that investment in durable patio covers bring about a 5-to-1 return when you sell your home. If, however, the budget will not stretch to cover major construction projects, consider crafting your own canopy from 2-inch round wood frame and heavy waterproof canvas. If you cannot sew, use contact cement. With a little imagination and ingenuity, you can install your own deluxe patio cover for about $100 and one day�s work. Poly-vinyl chairs and chaise-lounges seldom survive even one entire summer. Over the years, you probably have spent as much on allegedly �inexpensive� patio furniture as you invested in your living room couch and love seat. This time, when you buy chairs and lounges, think long-term: look for old school wooden and metal furniture and decorate for comfort and style with colorful cushions and pillows. Some day, you will build a great brick barbeque and fireplace. For now, though, you can find perfectly functional little hibachis or mini-grills for under $10. Big enough to cook a whole family�s burgers, but small enough to clean-up in the kitchen sink, these great little coal-burners make it easier to grill-out than cook in. Of course, if you cook it outside, you ought to eat it outside. Your home improvement retailer has an easy-to-assemble picnic table kit for about $50, and it goes together in about an hour with just a screwdriver and wrench. Beautify and fortify your patio with little trees, small shrubs, robust plants and wildflowers. To keep the area cool, put a line of trees along your patio�s southeastern exposure. To extend your outdoor season, plant a row of evergreens along the �storm side� of your patio so that you have natural defense against cold winds. If you plant sturdy shrubs, your patio never will need railings or walls. Yes, the box says �Christmas lights,� but those strands of little white lights glow just as bright and inviting against the summer sky as they shine in winter, and they always look inviting. String your lights underneath your roof beams for warm interior lighting, or stretch them along the eaves just as you would during the holidays. Add even more durable and inexpensive light with solar-powered yard lanterns along walkways or at the edges of flower beds. Step-by-step Slow-and-Steady Renovation and Remodeling. You add considerable value to your home and major fun to your family time when you renovate and upgrade your patio. You can ultimately have an heiress-worthy HGTV patio if you work steadily from the ground up. Expand and beautify your slab; then add brickwork and an ornamental fountain. Add a real roof that blends into your home�s existing roof line. Year by year and project by project, you will create the consummate outdoor sanctuary. Denise Roberts is a guest writer for design blogs. She recommends outdoorfurniture.com as a great place to find Illinois outdoor furniture. 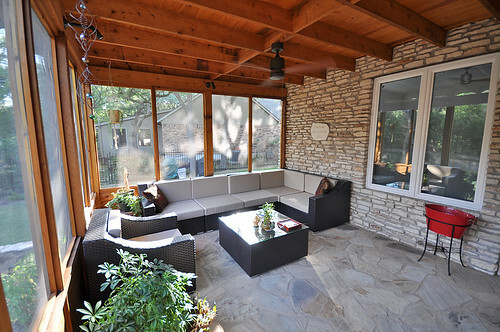 Some patios have a stunning view while others have a view that desperately need to be hidden. Whether your patio looks out over the mountains, captures a view of the sea, or does nothing more than peek into the neighbor�s lot, you can improve the view and the patio with the right d�cor. This space is a valuable part of your home, so you should make the most of it with the right decorations.